When the cool weather comes, its time to harvest the crops that farmers have worked hard to cultivate all spring and summer. Although most conventional farms don't produce mushrooms, September marks the annual Mushroom Harvest at Sorrentino's, with 2015 marking the 21st year. 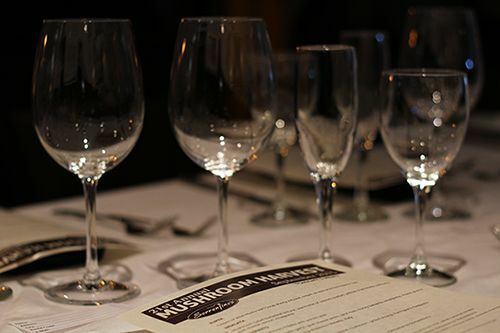 Last week I had the opportunity to preview the Mushroom Harvest menu at Sorrentino's Bistro in south Edmonton. While I've always known about the annual Garlic Festival in April, I feel like the Mushroom Festival doesn't get enough love, as this is the first year I've noticed it! Come on, mushrooms are fun, guys! (the puns will end here.) For the month of September, the Sorrentino's Restaurant Group (South/Downtown/Little Italy/West/St. Albert + Bistecca) will feature the Mushroom Harvest menu in addition to the regular menu at each of their restaurants. The menu will differ from one location to the next, so check them out before you head to your restaurant of choice. Additional events like mushroom cooking classes, exclusive dinners, and foraging opportunities are available too! To kick off our evening, Martin Osis from the Alberta Mycological Society gave us a bit of history and an introduction to all the mushrooms we would be enjoying that evening. Contrary to their placement in a supermarket, mushrooms are more closely related to meats, given their texture and high protein content. Mushrooms are low in carbohydrates and calories, and their preparation differs widely from one culture to the next. These fungi are very regional and will be cooked in different ways to release their flavours. Where one mushroom is popular in cream sauce, another variety may be more suited to frying or releasing flavour into broth. 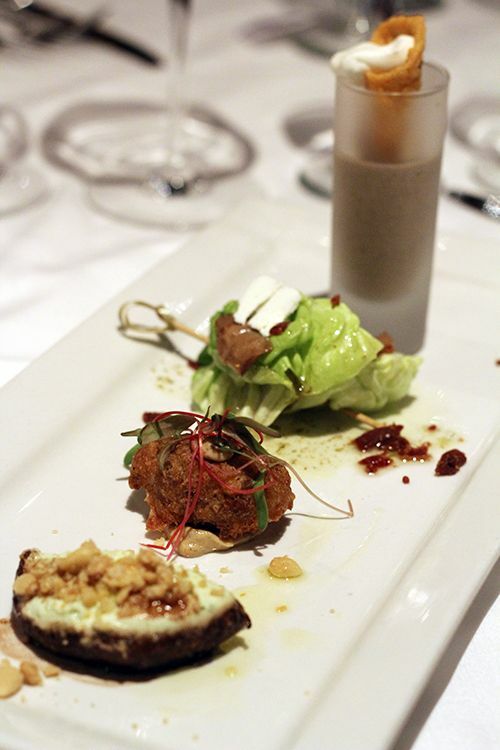 Our first plate of the evening showcased four sample sized courses and a variety of mushrooms. The Zuppa was a sherry infused cream of wild mushroom soup with cream drizzle and a parmesan tuile. The sherry cut through the creamy soup very nicely, and I would happily enjoy a big bowl of this comforting soup on a cold evening! Sorrentino's is selling this soup base for $10 all through September so you can make it at home as the cool weather sets in. Our Insalata course was a mushroom salad comprised of butter leaf lettuce and a warm mix of crimini, button, and yellow chanterelle mushrooms, finished with crisp pancetta, goat cheese and a light lemon vinaigrette. The mix of mushrooms allowed for an appreciation of the different textures and flavours of each ingredient. Third on the plate was a wild mushroom fritelle with porcini aioli. Similar to a donut of sorts, it was nice and crisp but it was difficult to tell there were mushrooms in there. Last of all was a portobello mushroom stuffed with garlic and goat cheese pesto, topped with pine nuts and a honey balsamic vinaigrette. The meaty texture and flavour of the portobello combined well with the garlicky, creamy cheese! Aside from the soup, this was my other favourite on the plate. Our next plate brought a sampling of larger fare - risotto and ravioli. 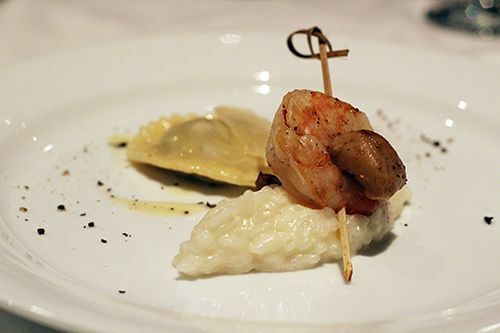 The risotto featured creamy Carnaroli rice with a lobster mushroom, grilled shrimp, and Parmigiano-Reggiano. I personally haven't had a lobster mushroom before and was surprised to hear that it is actually a fungus that thrives by growing like a parasite on other mushrooms, giving them the characteristic orange hue of a cooked lobster. This mushroom holds it's firm texture and colour throughout the cooking process and is great for frying. This neat little mushroom also possesses a faint seafood-like flavour! It paired great with the shrimp, and if the risotto was cooked to a slightly softer consistency this would be a great dish. The Portabella & Crimini ravioli was another star of the evening for me. Oven-roasted portabella and crimini mushrooms were enveloped in egg pasta with onions, roasted garlic, mozzarella and Parmigiano. The garlic lemon butter white wine sauce was to die for and brought everything together. If you're checking out the Mushroom Harvest menu, this is a must-try! Our Secondi course was like a surf and turf of sorts, wish fish and veal in sample sized portions. 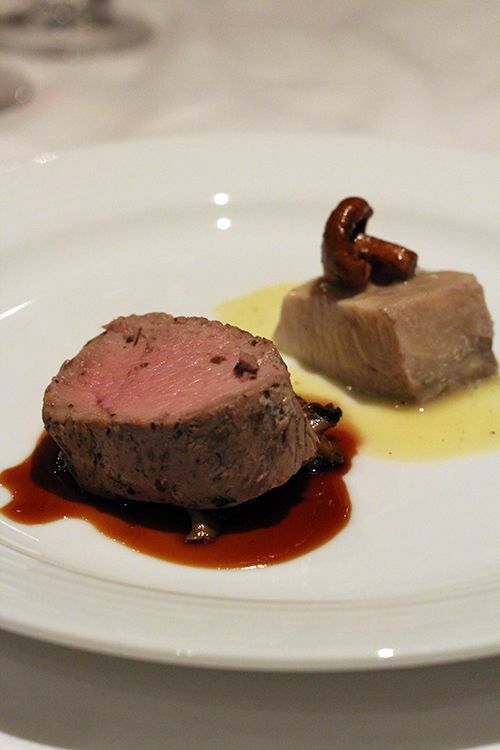 The Veal and Mushrooms was presented as a medallion of veal on a bed of wild mushrooms, all drizzled in salted caramel. The veal was cooked nicely, and contrary to what you may be thinking, the salted caramel added a unique yet tasty dimension of flavour to the meat and mushrooms. The other side of the plate featured Cobia, the catch of the month. The fillet was poached in San Benedetto mineral water and served with sauteed Chanterelles and a thyme and lemon Chardonnay reduction. Chanterelle mushrooms are not grown in Alberta, but can be found in abundance in our neighboring provinces of British Columbia and Saskatchewan. Chanterelles are light in flavour which makes them a perfect accompaniment for white fish. The fish was cooked well and flaked easily, but the lingering fishy flavour at the end of each bite was a little strong for my liking. To my surprise the dessert for the evening also included the use of mushrooms! Candy Cap mushrooms have a flavour similar to that of maple syrup, and are typically used as a flavouring agent. 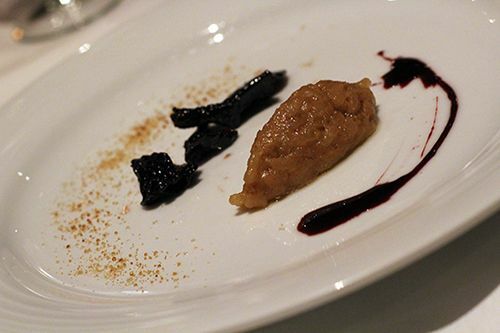 The candy caps in our dessert were poached and sat on a plate with a quenelle of Grand Marnier rice pudding and a streak of Amarone jus. The poached mushrooms were sticky and sweet, with a rubbery texture to them. The flavour complemented the caramel flavours in the rice pudding, but the drastically different textures in each component didn't quite work for me. This mushroom based dessert is available only at Bistecca, and is worth a try if you want to try these dessert mushrooms out. For the remainder of the month you can head out to your nearest Sorrentino's to get a taste of the Mushroom Harvest menu. As a special feature, every Monday is Mushroom Mania Monday at the South, West, and St. Albert locations, you can enjoy a Mushroom Harvest pasta and 3 oz. of the feature wine for $20. It's a great price to be able to eat and participate in the festival! Make sure to also check out the additional events that Sorrentino's is offering this month - perhaps go foraging, or take in a fun cooking class, and gain some extra mushroom knowledge. *Disclosure: Sorrentino's invited me to attend their media tasting. Views expressed in this post are solely mine. I was not expected to feature this restaurant on my blog, nor obligated to do so. This post is 100% my opinion, and as always, my priority is to you, the reader, to present an unbiased, thorough review. Omg...sooo yummy! I love mushrooms and love everything about the earthiness, richness, dirty, musky, pungent everything! I love that appetizer you got with the different textures and types...I think I could use that but with just 3x more food.